The aim of the research was to identify the functional structure of rural communes in Poland. The functional types were further characterized and spatially delimited. The research drew on 2015 data from the Central Statistical Office database, Local Data Bank and statistical yearbooks: ‘Voivodship, subregions, poviats and communes’. 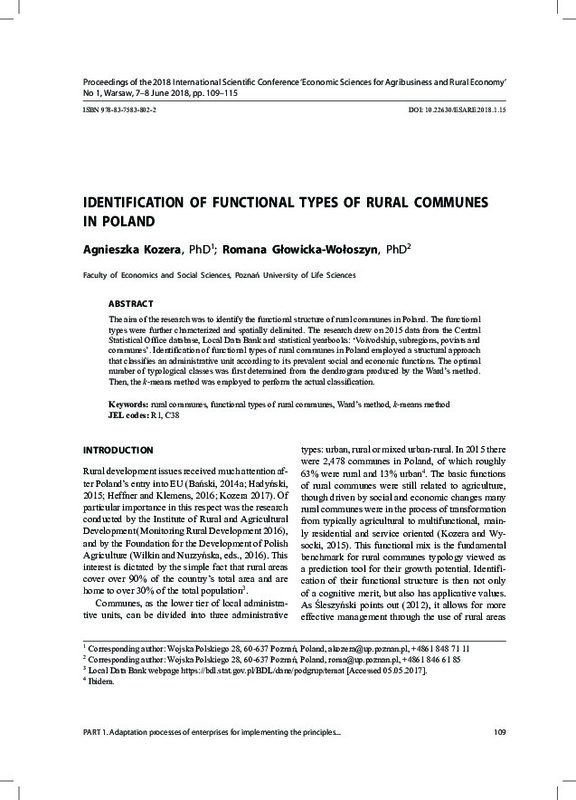 Identification of functional types of rural communes in Poland employed a structural approach that classifies an administrative unit according to its prevalent social and economic functions. The optimal number of typological classes was first determined from the dendrogram produced by the Ward’s method. Then, the k-means method was employed to perform the actual classification.